The club began as a dream spawned by Helen & Danny Evanovich during summer of 1957. The dream didn’t come about haphazardly. The early meetings held in the basement of the old Shorline Café through the benevolence of owner Merle Crum and were focused with plans carefully orchestrated by around 28 charter members. The history of our burgee began at the December 4, 1957 Charter meeting with the naming of a committee to prepare and present designs. The committee consisted of Charter members Heine Dole, Tom Miars and Dan Oliver. During the December 17, 1957 meeting, 7 designs were presented. Selecting the final design proved just a bit difficult however the voting resulted in selecting the burgee we’ve used ever since. In May 1958, a group of Yacht Club ladies presented the first hand sewn burgees designed by Charter member Heine Dole and his committee consisting of Tom Miars and Dan Oliver. After 9 months of operating under a Charter, we were awarded our Washington State approved Articles of Incorporation June 1958. The Evanovich dream really took off and a “winner” was born. In 1962 we moved to the larger quarters of the Fortnightly Hall. 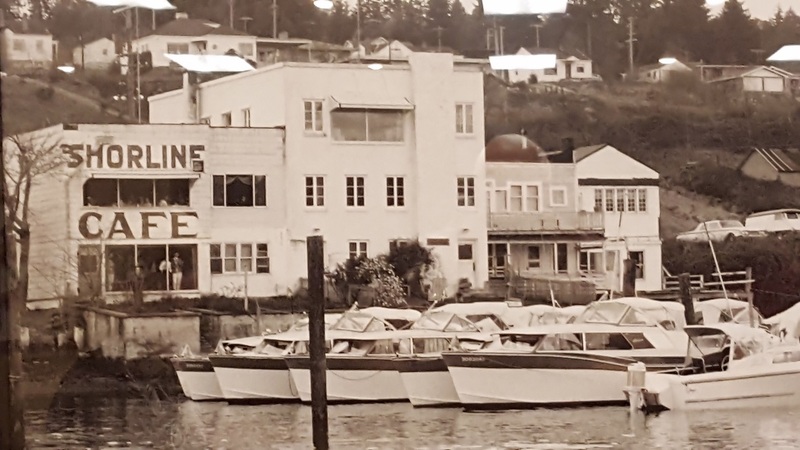 In 1964 the Club purchased that hall to make a permanent home for the Gig Harbor Yacht Club. Within 20 years however, yet a larger home was needed. In the summer of 1988 we sold the Fortnightly Hall and began looking for a larger permanent home. During this interim, meetings were in the Eagles Club in Gig Harbor and we held social events at Port Orchard Yacht Club. In 1991 Commodore Walt Sikora opened the September general meeting in our current clubhouse. The Gig Harbor Yacht Club celebrated its 60th anniversary during the September 29, 2017 TGIF social event. The voyage of the Gig Harbor Yacht Club continues.